Professor Alexander Saxton (Christopher Lee) has returned from an expedition in Manchuria with a curious box. He embarks upon the Trans-Siberian railway, where he meets an old rival/associate, Dr. Wells (Peter Cushing). A number of strange deaths occur around Professor Saxton's crate in which he claims he has found a missing link from ape to man frozen in the mountains. When he's finally forced to open the crate, the beast is gone and it is harboring something far worse inside it than anyone is prepared to deal with. Horror Express is marvelous low budget film that has been mostly overlooked in favor of other Cushing-Lee pairings. The story moves along at a lively pace, rarely allowing the viewer much time to idle. In those few quieter moments its a delight just to see Cushing and Lee spend some time in the same train car together. Their nearly constant sniping at one another brings some needed comedy and keeps the film from becoming a tedious monster hunt in the confined spaces of the train. About halfway through the film, Horror Express manages to handle a genre switch with a surprising deftness that doesn't undermine any of the horror that has come before. Aside from its stars, Horror Express has another big strength, the story is excellent at constantly inflating the threat against our heroes; the danger comes from more than just a shaggy ape-man as the authorities show they cannot be trusted either. Cossacks led by the quite possibly insane, Captain Kazan (Telly Savalas) board the train to sort things out and end up doing more harm than good. There isn't much in the way of gore, but what is there works very effectively. The sight of boiled white eyes and weirdly smooth brains that mark the monster's victims are unique enough to disturb even after several viewings. The period costuming adds a more lavish look to the proceedings than would be expected. The train car often feels like it is just a set being rocked around by stagehands but that only really becomes evident during the few moments when something isn't happening. 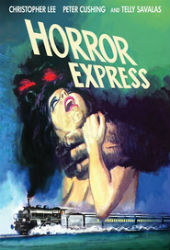 Special note should be given to the Severin Films release of Horror Express, after years of seeing the dirty cropped print that was used in so many cheap DVD sets, the opportunity to watch it in its proper framing, with a virtually artifact free image that is bright and colorful is simply astonishing. It felt like watching an entirely different production. I had feared the clarity of Blu-ray might expose the flaws of such a small budgeted film but, other than some of the train model work being a little less than convincing, it all holds up admirably. Horror Express is a movie that has been dismissed for years, and I'm glad to see it slowly coming around to being appreciated by more and more people as an innovative and exceptionally fun genre mash-up. CRazy underrated, I'm also happy to see it getting more recognition. I need to get my hands on the proper release... I only have it in two or three of those 50-in-1 sets.